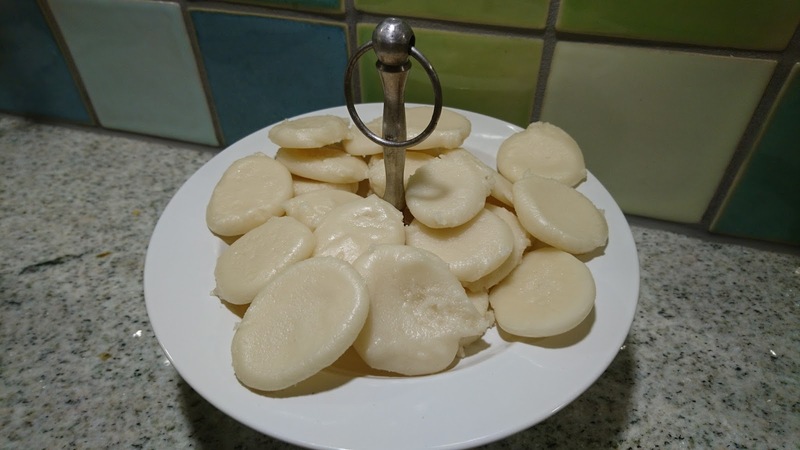 At Midnight New Year´s Eve it is tradition to enjoy marzipan cakes (kransekage) together with champagne/sparkling wine, when the bell will ring it´s 12 strokes. Heat the oven to 210'C (conventional oven). Add marzipan, icing sugar, egg white, lime zest and freeze-dried raspberry into a medium mixing bowl. Knead the marzipan cake together by hand. Divide the marzipan cake mass into smaller portions, which is rolled by hand into thinner rolls. Cut each roll into 3-4 pieces of equal size. Bake the marzipan cake mass at 210'C for 8-10 minutes. Cool down the marzipan cake. Decorate the top of the marzipan cake with icing sugar - optional. Let the icing sugar dry. 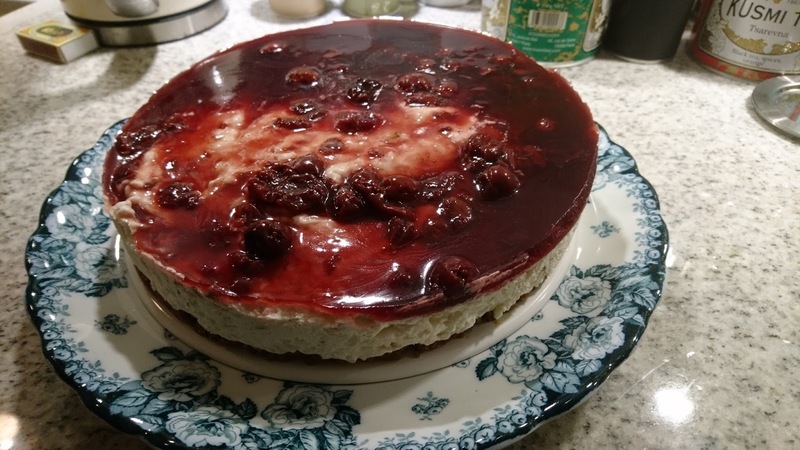 After my success with the Christmas style cheesecake (created for the annual Christmas coffee), I decided to make anew cheesecake with the theme of New Year using a Philadelphia recipe. The New Year theme comes from the bottom layer of marzipan cake and the addition of sparkling wine in the cream cheese base. I followed the recipe without making any modifications. Another time I would bake the marzipan cake bottom layer some more, at it is too the wet side in my opinion. I am also uncertain, if the layer of Daim chocolate should be a part of the cake another time, as Daim is not representing New Year in my opinion, but it does add a crunchy layer to a cheesecake with a lot of soft texture. And finally I would reduce the actual portion of the cheese cake layer to half the amount as it become to heavy, when eating the cake. The taste part of the cake works very nice with the addition of sparkling wine into the cream cheese cake mass. Heat up up the oven to 220'C. Whip the sugar and egg whites into a foamy mass. Afterwards add in the grated marzipan, keep whipping until the mass is homogeneous. Cover the bottom layer of the spring form with baking parchment. Fill the marzipan cake mass into the spring form, distribute the mass evenly in the form. Bake the marzipan cake bottom layer at 220'C for 15 minutes. After a few minutes spread the chopped dark chocolate on top of the marzipan cake. Let the dark chocolate melt, use a brush to spread the melted chocolate evenly on top of the marzipan cake. Spread the chopped Daim chocolate on top of the dark chocolate layer. Add the gelatine sheets into bowl filled with cold water, let the gelatine sheets soak for 5 minutes. Add the cream cheese into a medium-large mixing bowl. Whip the cream cheese together. Add in the quark, and the mass together. Remove the vanilla corns from the vanilla pod, use a spoon full of the icing sugar to separate the vanilla corns from each other. Add in the vanilla corns and icing sugar, and whip everything together. Heat up 1½ dl of the sparkling wine in a small bowl placed in cooking pot with hot water. Add in the gelatine sheets. Stir until the gelatine sheets are dissolved. Afterwards add in the remaining 1½ dl sparkling wine. Add in the sparkling wine little by little into the cream cheese cake, while you whip the mass. Whip the mass very well to ensure, that the gelatine is evenly distributed to avoid gelatine strings. Fill the cream cheese cake mass on top of the marzipan cake layer in the spring form. Store the cake cold in the refrigerator for minimum 4-5 hours or night over, so it can set. Remove the cheesecake from the spring form. Divided the fresh strawberries into half, place the strawberry pieces around the cake, before serving it. Serve, perhaps with a glass of sparkling wine ? Christmas was removed from my home and kitchen this morning after the annual Christmas lunch yesterday, so now it is time to prepare for New Year´s Eve tomorrow, where marzipan cake (kransekage) is so tradtional to eat here in Denmark, as we step into a new year at Midnight. The marzipan cake is served together with sparkling wine/champane/bobbles, if you really would like to enjoy this combination make sure, that the sparkling wine is sweet, as the combo of dry sparkling wine and sweet marzipan is not creating any magic together !!! If you would like to bake your very own marzipan cakes, I will already now share my entire collection of various suggestions on marzipan cake (known as kransekage in Denmark), which I have created during the "life time" of Kitchen of Kiki in this blog post. It will give you time to go shopping for the needed ingredients as well as baking them for New Year's Eve tomorrow and perhaps clear out the last Christmas marzipan left-overs. I find, that the major advantages of making your own marzipan cake is, that you are in control of the overall sweetness in the final cake, so you can make the cake more or less sweet according to your sweetness preference, instead for "just living with" the sweetness in the cakes, which you buy, which I find to be too sweet !!! If you would like to have more softness in your marzipan cake, you should freeze them after baking. The only drawback is, that I find freezing to reduce the overall flavour profile of the cake. The "classic" type of marzipan cake is the white version of these zebra marzipan cake. The white version is made from plain marzipan, while the dark version is made from marzipan containing cocoa. Another good tasting marzipan cake could be these marzipan orange cakes or with an extra little twist in of orange flower as here marzipan orange cakes with orange flower. A third suggestion giving similar looking cakes are marzipan cakes with clementine and Cointreau. 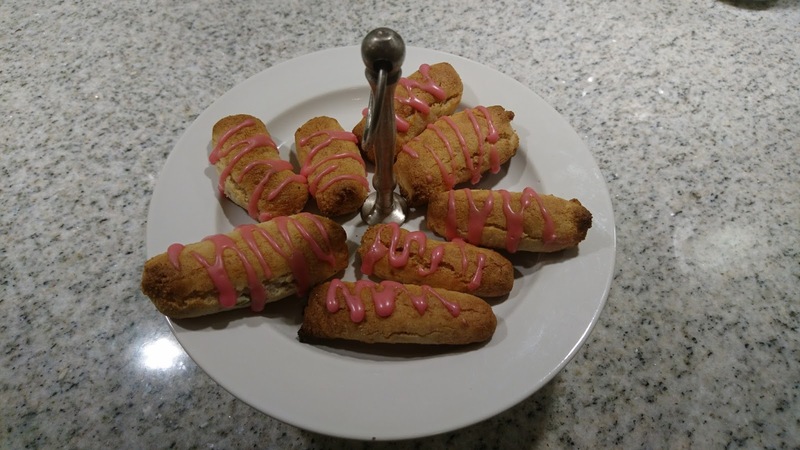 Another excellent taste twist on "kransekage" is pomegranate marzipan cake combining the freshness of pomegranate with the sweetness of marzipan. As a colourful farewell to 2016 these baked marzipan confect are an option. 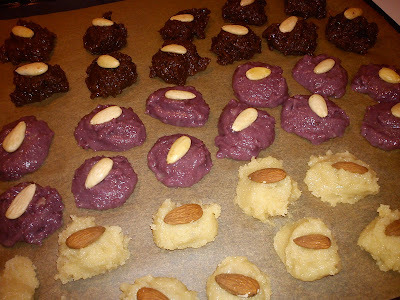 The only drawback is, that the forest fruit marzipan (purple looking marzipan) is loosing colour during the baking !!! However, you do not need to worry about this topic, as Odense Marcipan has withdrawn this specific marzipan product from their product range. In 2013 liquorice marzipan was the "new black flavour" within the marzipan world, as it so many other food items here in Danmark, so therefore I created these liquorice marzipan cake. Also in 2014 I made liquorice marzipan cake. I 2016 I made these marzipan cake with ginger and lime. Another fantastic flavour combination would be this marzipan cake with raspberry and lime, which you share with your sweet heart. 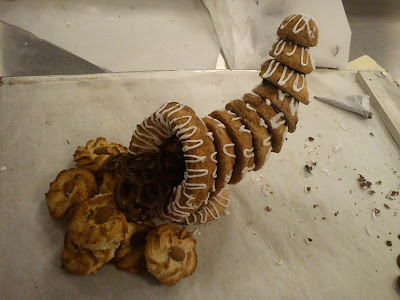 In 2015 I made this fantastic marzipan horn. As usual we had the usual tapas selection from Osteriet with company in form of two home-made breads: rye bread and cooking pot bread with fig and hazelnuts. This year we also could enjoy these marinaded herrings. As tradition demands we started the Christmas lunch with a cocktail in form of French Martini. Today is the day of farewell to this year Christmas Calendar of 2017, which I hope have brought you joy during a perhaps stressful Christmas time. I have for sure got a kitchen full of Christmas goodies, when making all the many blog posts for this year´s Christmas Calendar. It this time of the year, when it is time again to invite some fantastic women for my annual Christmas coffee. As usual we had an evening, where my kitchen living area was full of good talks and great laugther, while my guests did their best to eat me of my kitchen !!!! Hannibal the Cat was doing his best to eat my of the kitchen, as he decided to lick the cream topping of the Mont Blanc tarts, as he manged to enjoy 6 out of 9 tarts, while I lighting some tea light lamps out at the entrace as welcome to my guests. Besides from helping me with eating plenty of Christmas calories, I also got some lovely hostess gifts incl amaryllis flowers, thank you so much for these great gifts :-) My guests know me to well, the colour of my new tea towels were fitting perfect with the colour of kitchen tiles. For my annual Christmas coffe I decided to make a cheesecake with ris a la mande as the theme. I had seen various recipes on such type of cheesecake. I decided to this recipe as staring point, which I when adjusted to my preferences. Both Christmas coffee guests as well as my colleagues really liked the taste and the colour variation, so every single piece were eaten with great pleasure. I am planning to make another cheesecake with New Year as theme for the next time, when I have guests coming around for the annual Christmas lunch for fantastic women. 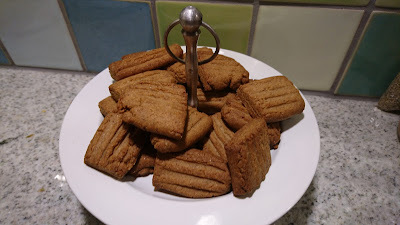 Destroy the brun kager into small pieces using a rolling pin. Fist place the brun kager in a freezing bag, so you can control the whereabouts of the cakes. Stir the butter and brun kager pieces together in a medium mixing bowl. Afterwards press the mass into the bottom of the spring form (18-22 cm). Place the gelatine sheets in a bowl with cold water, let the sheets soak for 5-10 minutes. Add the cream cheese and sour cream in a medium mixing bowl, stir it together using a cooking spoon. Add in the icing sugar and vanilla sugar, stir t together. Add in the rice porridge gradually, stir after each addition. Squeeze the gelatine sheets from excess water. Melt the gelatine sheets in a water bath. 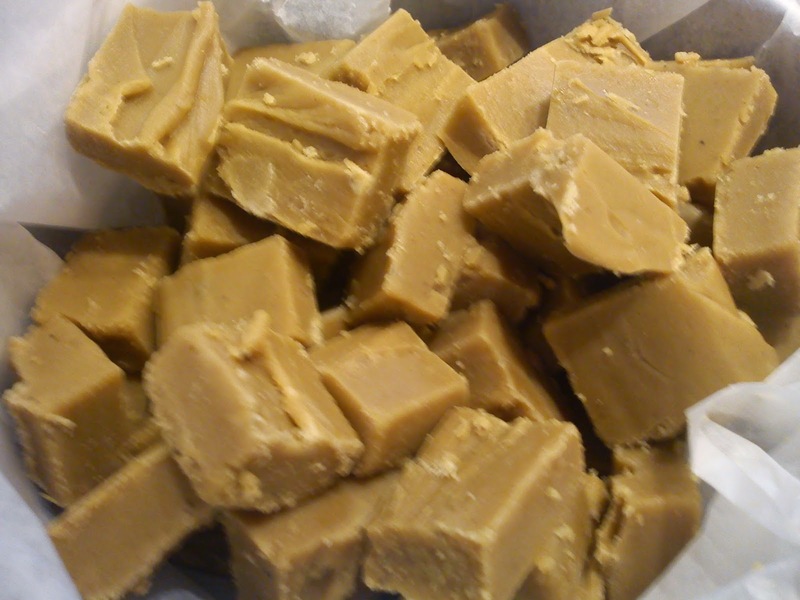 Add the melted gelatine gradually into the cake mass, while you keep stirring the cake mass to avoid lump formation. Whip the dairy cream into foam. Stir in the whiped foam gradually. Fill the cake mass into the spring form on top of the biscuit layer. Place the cake cold in the refrigerator for 2-3 hours. Separate the cherries from the cherry sauce. 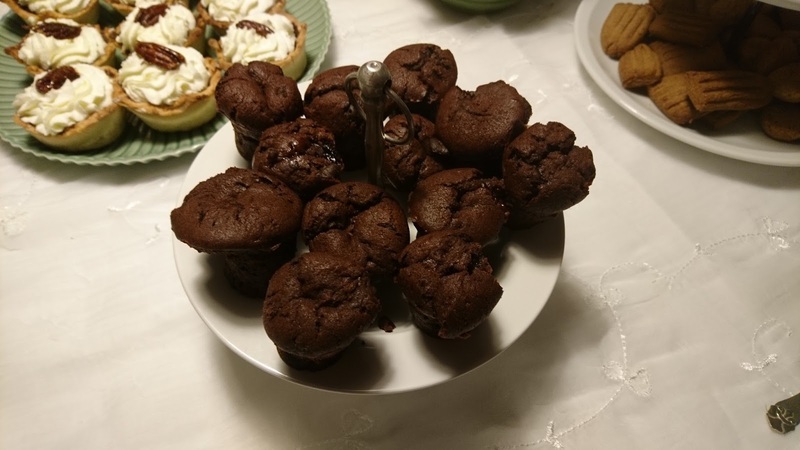 The excess cherries could be used in these chocolate cherry muffins. Meanwhile place the gelatine sheets in a bowl with cold water, let the sheets soak for 5-10 minutes. Add the cherry sauce with a few amount of cherries into a cooking pot. Heat up the sauce to 35-40'C. Squeeze the gelaltine sheets for excess water. Add the gelatine sheets into the cherry sauce. Stir the sauce, until the gelatine sheets are melted into the sauce. Fill the cherry sauce on top of the cheesecake. Store the cheesecake cold in the refrigerator for 3-4 hours or night over. Using the flavour combination of chocolate and cherry from the chocolate cherry trifle, which we made at the Christmas afternoon tea course at Denman, I decided to bake some chocolate cherry muffins for the annual Christmas Coffee, as I had some cherries left-over from the ris a la mande cheesecake. I used a muffin recipe from the baking book "A piece of cake" as starting point, which I when adjusted to my purpose. Melt the butter, afterwards add into the sour cream and lemon zest, stir together. Add egg, sugar and vanilla sugar into a mixing bowl, whip it light and foamy. Add in the cocoa powder, wheat flour, salt and baking powder. Mix it together into a homogeneous mass. Stir in the chopped chocolate pieces. Fill up the muffins half way with the dough. Place a cherry into the muffin dough, fill more muffin dough on top, so the cherry is hidden. Bake the muffins at 200'C for 15 minutes. Check, that the muffin is baked, before removing it from the oven. Cool down the muffin, before making the muffins out of the silicone form. For the people coming around this evening for the annual Christmas Coffee, I will be serving this mulled punch as the "gløgg" item. This mulled punch is without alcohol, as a lot of my guests will be driving. I found the recipe in a small recipe booklet within the December issue of Good Housekeeping. 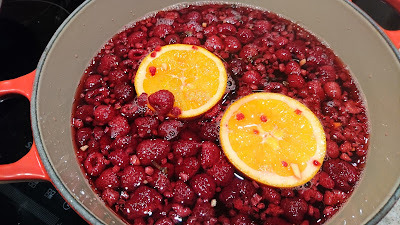 I have only made a few modifications to the amount of added raspberries and the infusion, which I have extended from 5 minutes to almost 24 hours to get a much of the flavour of spices into the mulled punch. Add all the ingredients into a large cooking pot. Bring it to the boil, and let it simmer gently for 10 minutes. Keep the lid on. Place the cooking pot cold for 8-24 hours, so the spices can infuse the juice. Strain the content through a sieve. Press the fruit gentle to get all the juice out. Bring the liquid back into the cooking pot, and heat it up to the boiling point. Pour into glasses with is garnished with slices of orange. For my annual Christmas Coffee I have been remaking these Mont Blanc tarts, which I learned to make at the course in Christmas afternoon tea. 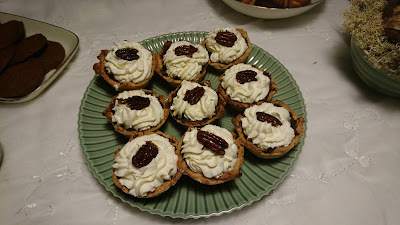 These Mont Blanc tarts are composed of various elements such as tart dough in form of flaky pastry, candied pecans, filling of chestnut and finally some vanilla flavour whipped cream, so what not to like ?? Add the flour, butter and butter into a medium size mixing bowl. Rub it together using only the finger tips and not the palms. Run it until it resembles fine breadcrumbs. Add in the water and vinegar, mix the dough very fast into a homogeneous mass. Form the dough into a ball, which is covered in cling film and place in the refrigerator for minimum 1 hour or up to 3 days. Allow the dough to rest for 30 minutes, if it has been in the refrigerator for more than a few hours. Place smaller portions of the dough on the kitchen tabletop, which has been lightly floured. Roll out the dough to a height of 3 mm, and cut out circle of 14 cm. The dough should only the rooled out 3 times in total. Cover the tart forms (8-9 cm) with the dough, gently press the pasty dough into the corners of the tart forms. Place the tart forms in the refrigerator for 30 minutes. Cover the dough in the tart forms with baking parchment and fill with baking beans. Bake the dough blind at 200'C for 18 minutes. Removed the baking parchment and baking beans and bake for another 8 minutes at 200'C, until the tarts are golden brown. Remove from the oven, and the let the tarts cold down, before they are removed from the tart forms. Cover a baking tray with baking parchment. Add the maple syrup, glucose syrup and sugar in a small saucepan. Stir until the sugar has melted, when add the salt and the pecans. Stir until the pecans are covered in syrup. Place the pecans on the baking tray. Bake the pecans in the oven at 210'C for approx 8 minutes, or until the syrup is bubbling around the pecans. Remove the pecans from the oven, and let the pecans cold down completely. Melt the chocolate. Glaze the inside of the tarts with chocolate. Set aside form 30 minutes, so the chocolate is stiff. Sweetened the chestnut spread with icing sugar to desired sweetness level. Fill up the tart with sweetened chestnut spread. Set aside. Whip the dairy cream, icing sugar, vanilla extract and cognac into whipped cream. Top up with the whipped cream on top of the chestnut spread, so it form a top. Cover the top with candied pecans. This Sunday dinner could be regarded as a pre-test of the Christmas dinner. I think it can be could to practice one or two times, before one of the most important dinners of the year, the meal for Christmas Eve !! I have located this recipe on glazed turkey crown in the a small recipe booklet from the December issue of Good Housekeeping. The only change is, that I have been using a turkey breast with a weight of 900 g and less bacon. Weight your turkey breast in order to calculate the cooking time. 20 minutes per kg + 1 hour and 10 minutes as starting point. The turkey breast I was working with weight 900 g, so I calculated a cooking time of 1 hour and 30 minutes. Rub the turkey breast with the soft butter and place the tarragon sprigs on top of the butter. Lay a rasher of bacon on the left-hand side of the turkey beast. Place the second bacon rasher horizontally across the breast, repeat this pattern with the rest of the bacon rasher with plenty of space between those. Tuck the end of the bacon under the turkey breast. Place the turkey breast in a small oven tray. Pour the vegetable stock into the oven tray. Put the lid on the oven tray or cover the surface with foil. Place the turkey breast in the oven at 200'C in the middle. Roast the turkey for the calculated time, but 20 minutes. Mix the mustard and honey together. Remove the foil/lid from the cooking tray, glaze the turkey breast with the honey-mustard mixture. Bake the final 20 minutes without the foil/lid. Check, that the turkey breast is cooked by pinching the thickest part of the breast with a knife. The juice from the breast should run clear, otherwise give it another 10 minutes at 200'C. Remove the turkey from the oven, when cooked. Place on a warm plate, cover loose with foil and leave it to rest for 20 minutes. Meanwhile turn the vegetable stock from the oven tin into a sauce. Serve the turkey together with sauce of the vegetable stock, cranberry sauce, potatoes and vegetables. I this recipe on cranberry sauce in a little recipe booklet from the magazine "Good Housekeeping, which I brought home with me from shopping exhibition to London. I made a few modifications, so it fitted to the amount of available cranberries as well as available ingredients in my kitchen. Put all the ingredients into medium cooking pot. Reduce the heat, and let the sauce simmer without lid for 30 minutes, stirring occasionally. Remove ½ the cranberries from the sauce. 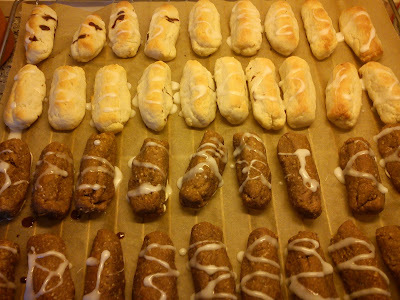 Remove the cinnamon stick as well as ginger pieces. Blend the remaining ingredients in the cooking pot together. Add the whole cranberries to the blend sauce. Pour the sauce into a serving bowl and served it as a side dish for the turkey breast. Since I was a little girl I have been loving to eat buns with a combinations of raisins, orange peel and sucat. 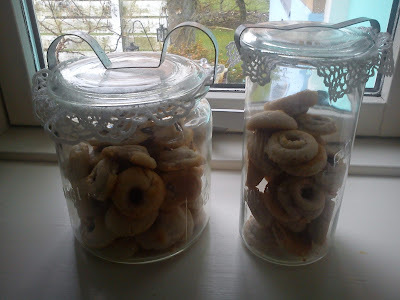 I have made a few modification to this recipe on kløben buns in form of addition of vanilla sugar and finely chopped pickled ginger. I have also changed the raising method from cold and long time raising to warn and shorter raising time. Dissolve the yeast in the milk. Add egg, salt and sugar as well into the milk. 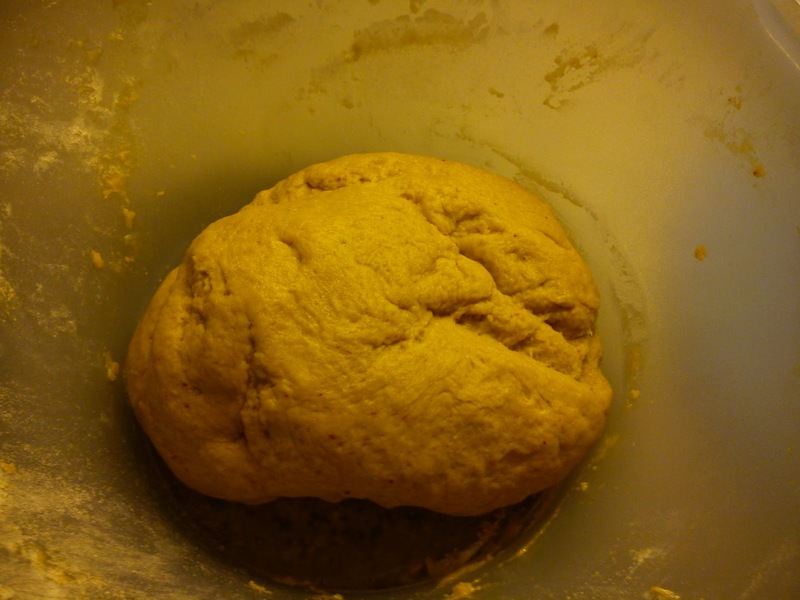 Knead the dough together for 10 minutes. Let the dough rest warm for 4 hours. Cut the butter into small pieces. 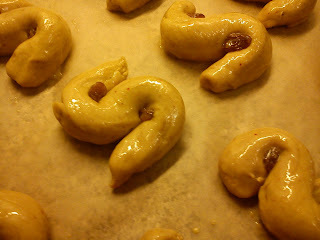 Knead the butter, orange peel, sucat and raisins into the dough. Divide the dough into 12 buns. Let the bun raise for 30 minutes. Bake the buns at 200'C for 15 minutes. Serve the buns together with some butter !!! Today it is Lucia day, which is a huge day in Sweden, where they will enjoy "lussekatte" together wiht the all the singing. In Denmark we have the same tradition with singing people in white dresses walking around with burning candles in their hands and the "Lucia bride" person in front of the group will have burning candle on top of her head !!! But we do not eat these buns full of saffron and butter. 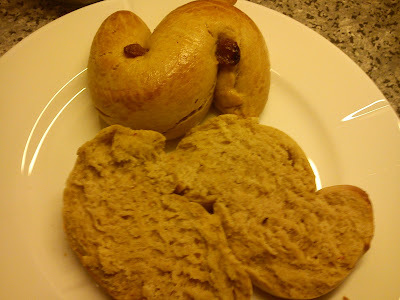 I have locatede this recipe on a Swedish blog Lucia buns / lussekatter called Anne´s Food. The buns taste fantastic with this combination of butter and saffron. Crumble the yeast in a mixing bowl. Meanwhile melt the butter in a cooking pot, when add the milk and cream to the melted butter. Heat up to 37'C and not higher, as higher temperature will kill the yeast. Add the butter-milk-cream mass into the mixing bowl, stir until you have dissolved the yeast. Place the saffron together 1 teaspoon sugar in a mortar and mix it well. Add it into the liquid in the mixing bowl. Add sugar, salt, the beaten egg and the flour into the mixing bowl. Work into a silky dough, the dough is very, very sticky and moist in the beginning, but it only takes a little kneading to change the texture of it. I always knead on time, 10 minutes, so I am sure, that the dough it needed enough. Let the dough rest/raise warm for 45 minutes. Divide the dough into 10 equal portions, I always a kitchen scale for this purpose in order to ensure equal baking of the buns. The traditional Swedish shape of Lucia buns apparently is like a S-shape with a raisin placed in the middle of the swirls on each side. Place the buns a baking tray covered with baking paper. Let the Lucia buns raise for another 15 minutes. Bake the buns at 200'C for 15-20 minutes. Enjoy the Lucia buns together with a nice cup of tea/coffee. Another recipe on madeleines with almonds, which I have located in the weekly magazine "Søndag". I have made no modifications to this recipe. 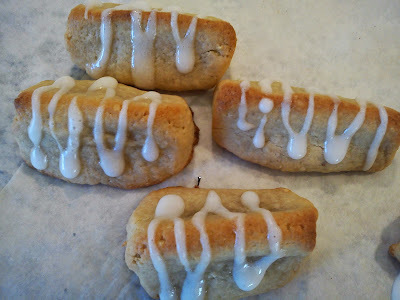 If you like I have Madeleine forms, when I could suggest you to try out these Madeleines with lime and rosemary or Madeleine with ginger, lemon and vanilla. Heat up the oven to 210'C. Melt the butter and honey together in a small cooking pot. Whip the egg and sugar together in a mixing bowl using an electrical whipper. Pour in the melted butter and whip until homogeneous. Add in the flour, almond flour, lemon zest, cardamon and baking powder, whip gentle until homogeneous. Pour in the milk, and whip gentle. Pour the dough into either madeleine form or small muffin forms. Bake the madeleines at 210'C for 10-12 minutes. Cool down the cakes, before they are stored in airtight containers. I have found this recipe on Christmas cookies with pickled ginger in the weekly magazine "Søndag". I made a few modification, as I did not have all the required ingredients in my kitchen. The taste of these cookies is just great. Heat up the oven to 180'C fan oven. Whip the butter together with the brown sugar, dark syrup and egg. Add in the wheat flour, baking soda, cinnamon and cloves, and whip until homogeneous. Use two teaspoon to place dough in a size of walnuts on baking tray covered to the baking parchment with a distance of 5-6 cm. Bake the cookied at 180'C for 12 minutes. After 6 minutes shift around with the baking tray to obtain an even baking. 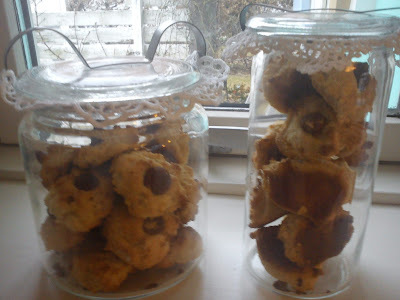 Cool down the cookies, before they are placed in an airtight container. The annual Christmas Fair at Trapholt has become a real most/have-do-thing for me, as the level of the different art booths is at a very high quality level. You can find "old" well known crafts people from previous years as well as new crafts designers. A good tip is to arrive from the very beginning in the morning, or perhaps even 10-15 minutes, before the museum and fair begins, so you are able to get a parking spots more or less next door to the museum. Besides from getting a good parking spot, you can also get a good look around the various arts and craft booths, before the fair area becomes over-crowed. The entrance is now ½ entrance free to the museum (it used to be free entrance), but for 55 DKK you get access to both the fair as well as the museum. So what could I "not live without" ?